appropriate information. Open source products will be your best assurance that your application that works now in the “Super-Turbo Hexium IX” machine of today, will work in the “Nanotech Cube Aleph” of tomorrow (I am exaggerating just a wee bit). 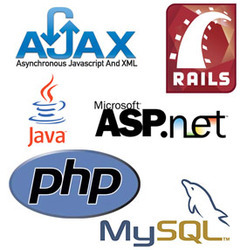 PHP (acronym for: PHP Hypertext Preprocessor), is a server-side embedded scripting language. This means that it works within an HTML document to confer to it the capacity of generating content on demand. You can convert your site into a web application, not just a collection of static pages with information that may not get updated quite so often, which may be alright for a “personal” web site (yes, we all have made such a beast), but not for one that is going to be used for business or for education. You may be asking “But, why PHP? There are so many other options like ASP, Cold Fusion, Perl, Java, Python, even good old shell/awk/sed scripts?”, and the answer will be: simplicity, an almost natural way of using databases and platform independence. PHP was designed to work on the web, and in this ambit it excels; connecting and querying a database is a simple task that can be handled in 2 or 3 lines of code. The PHP scripting engine is well optimized for the response times needed on web applications, it can even be part of the web server itself improving the throughput even more. If it were only a matter of improving the speed of the scripts, then PHP will be one of many solutions .But there is more to the PHP equation than that. There is the simplicity and robustness of the language and the scripting engine. There is the connectivity to an ever increasing number of database servers, the shorter development cycles and the ease (encouraged by the syntaxes and constructs) of creating modular and reusable components .And did I mention that it is open source? There’s no more waiting until the next release for a feature to be added or a bug to get fixed. Just take the source, make your modifications and there you are, instant customization and complete control. No more guessing at whether a particular function or feature is insecure, the code does not lie. And who knows, maybe your modification gets to be so popular that others may want to use it. The output is I am Samar. Yes php is free get from internet. You go to URL:www.php.net then you get software of php. The software name is php-tired. And you cannot beat the total price for a development environment using the combination of Linux, Apache, MySQL and PHP, not only cheaper than other more proprietary environments, but also more stable and robust. PHP also use in winxp,winme,2000. When put in perspective, AJAX is about reaching a better balance between client functionality and server functionality when executing the action requested by the user. Up until now, client-side functionality and server-side functionality were regarded as separate bits of functionality that work one at a time to respond to user’s actions. AJAX comes with the solution to balance the load between the client and the server by allowing them to communicate in the background while the user is working on the page. Without AJAX, there were two form validation techniques. The first was to let the user type all the required data, let him or her submit the page, and perform the validation on the server. In this scenario the user experiences a dead time while waiting for the new page to load. The alternative was to do this verification at the client, but this wasn’t always possible (or feasible) because it implied loading too much data on the client (just think if you needed to validate that the entered city and the entered country match). I present details of environments for two popular variants: Win32 operating systems (Windows 95/98/NT/2000/ME) and the MacOS. For the most part, your AJAX authoring experience is the same regardless of the operating system platform you use—including Linux or UNIX. ASP is a server side scripting technology that enables scripts (embedded in web pages) to be executed by an Internet server. ASP+ is the same as ASP.NET. ASP+ is just an early name used by Microsoft when they developed ASP.NET. ASP.NET is the next generation ASP, but it’s not an upgraded version of ASP. ASP.NET is an entirely new paradigm for server-side ASP scripting. You can read more about the differences between ASP and ASP.NET in the next chapter of this tutorial. ASP .NET uses the new ADO .NET. ASP .NET supports full Visual Basic, not VBScript. ASP .NET supports C# (C sharp) and C++. ASP .NET supports JScript as before. ASP .NET components are heavily based on XML. Like the new AD Rotator, that uses XML to store advertisement information and configuration. The first request for an ASP .NET page on the server will compile the ASP .NET code and keep a cached copy in memory. The result of this is greatly increased performance. Configuration of ASP .NET is done with plain text files. Configuration files can be uploaded or changed while the application is running. No need to restart the server. No more metabase or registry puzzle. ASP .NET is not fully compatible with earlier versions of ASP, so most of the old ASP code will need some changes to run under ASP .NET. To overcome this problem, ASP .NET uses a new file extension “.aspx”. This will make ASP .NET applications able to run side by side with standard ASP applications on the same server. Before ASP.NET can be installed on your computer, it is necessary to have all relevant service packs and security updates installed. The easiest way to do this is to activate your Windows Internet Update. When you access the Windows Update page, you will be instructed to install the latest service packs and all critical security updates. For Windows 2000, make sure you install Service Pack 2. I will also recommend that you install Internet Explorer 6. Read the note about connection speed and download time at the bottom of this page. If you have a Beta version of ASP.NET installed, we recommend that you completely uninstall it. Or even better: start with a fresh Windows 2000 or XP installation. From your Windows Update you can now select to install the Microsoft .NET Framework. After download, the .NET framework will install itself on your computer – there are no options to select for installation. ASP.NET is a Microsoft technology. To run ASP.NET you need a computer capable of running Windows. If you are serious about developing ASP.NET applications you should install Windows 2000 Professional or Windows XP Professional. In both cases, make sure you install the Internet Information Services (IIS) from the Add/Remove Windows components dialog. Nearly all major browsers have support for XML and XSLT. As of version 1.0.2, Firefox has support for XML and XSLT (and CSS). Mozilla includes Expat for XML parsing and has support to display XML + CSS. Mozilla also has some support for Namespaces. Mozilla is available with an XSLT implementation. As of version 8, Netscape uses the Mozilla engine, and therefore it has the same XML / XSLT support as Mozilla. As of version 6, Internet Explorer supports XML, Namespaces, CSS, XSLT, and XPath.